Honey-sweet (but nutty) – that’s us! Here at Loyola House we are gearing up to host Taste-real’s “Source It Here” event – an annual celebration of Guelph Wellington Local Food. It is a trade-show, workshop session, networking opportunity and a wonderful place to shop and graze! Every year I try to offer the most local products that I can – some graciously donated by participants! For more information on this wonderful event, see http://www.guelphwellingtonlocalfood.ca/source-it-here-networking-event This year along with the ever-popular Carrot Cake … yes, we still have Ignatian Farm carrots! 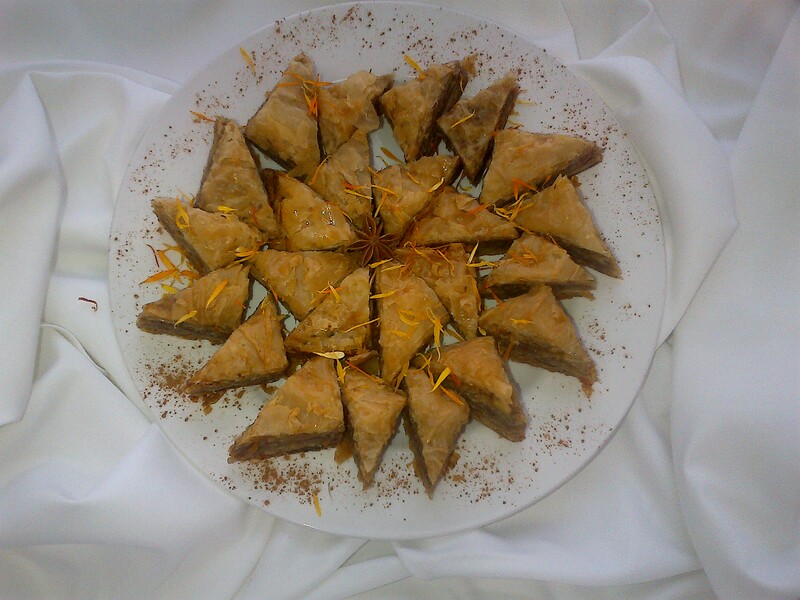 … I thought we would serve Baklava as well. Granted, phyllo pastry isn’t exactly made in our backyard but our honey is from Tuckamore Bee Co. made from bees who range and gather nectar from our property. It doesn’t get more local than that! I’ve been known to moan and groan about working with phyllo but it is a truly interesting and unique process making baklava. As with everything else, once you have the basics down, you can play around with flavours, ingredients and even textures. I have found that a finely ground filling helps the final product stick together better but I know people who prefer chunky bits of nut and (as we all know) there’s no arguing with taste. The evening before you bake, move 1 package of phyllo pastry from the freezer to the fridge and remove from cardboard wrapper – carefully! If you dropped it at this point, all the sheets would shatter and you would be very sad indeed when you came to assemble everything. Melt 2 cups of butter and return it to the fridge in a pyrex measuring cup. This is the easy way to make ghee – when it is solid again, you simply pick up the butter and pour off the milky whey. Then you have butter which is 100% fat and makes a nice, crisp baklava. Heat butter and oil a 9 x 13 inch baking tin. Unwrap phyllo and cut the sheaf of sheets in half so they will fit better into the pan. Cover the sheets you are not working on with a damp towel. Lay one sheet of phyllo in the pan and butter lightly with a pastry brush. If the sheets are too long, fold them over. If they are too short, alternate sheets on either side of the pan. You will end up with 40 layers … you don’t have to be too exact with each one! I find it best to keep the butter hot on the stove and pour off a little at a time into a small pyrex cup. That way you are always working with hot butter and not getting too much on your brush (and onto each sheet) at one time. Lay down 5 more sheets, buttering each one lightly after it is placed in the pan. Sprinkle a handful of the filling over the top. Lay down two more sheets and then another handful of filling. Continue like this, adjusting the size of your hands (ok, adjust the size of your “handfuls”) as necessary. You are aiming to have all the filling gone and have 6 or 8 sheets left to make a nice cap. Let the baklava cool somewhat and solidify. With a very sharp knife, cut the pastry into the size of pieces you will serve … it will be too crisp to slice after it is cooked! I like to cut this size pan into 20 squares and then to cut each square into 2 triangles. These pieces are small – but you don’t need too much of this intense sweet! Bake at 350 degrees F for 40 minutes or until nicely golden all over. Whole spices if desired … I use star anise – but only 1 or 2! Bring to a boil, then simmer 10 minutes. When the pastry comes out of the oven, pour the hot syrup over it all and let it cool uncovered. Like many things, this is really better the next day. Do be careful, though. You need a sharp grater for this and you need to be very aware of where the lemon ends and your skin begins! Enjoy your baking, enjoy the sunshine and the coming floods … and maybe we’ll see you next Monday at Loyola House.